Abstract: This thesis explores the absence of the chalice in the Christian ritual of the Eucharist in the thirteenth century. The absence of the chalice in the ritual indicates the absence of wine. In an interdisciplinary approach, this study integrates the historiographies of viticulture as well as of the Christian liturgy to answer the question: why did wine disappear from the Eucharist in the high Middle Ages? It is specifically focused on the northern regions of France, as this region is understudied in terms of viticulture. An exploration of the historiographies of viticulture and liturgy shows that they are segregated. Liturgical scholarship is largely theological in character. Any explanation for the absence of the chalice offered only refers to sacred trends. The historiography of viticulture is either strictly geographic and economic in character, or strictly cultural. Both strands of historiography are teleological in that they work towards the modern cultural, economic, or geographic importance of wine. By problematizing and integrating these distinct historiographies, is it possible to paint a fuller picture of the change in the Eucharist. Closely tied to the rise of towns and town culture, wine grew in expense and status. Also in this urban setting, wine became an important part of drinking culture, with a close connection to secular life. At the same time, concern for the spiritual purity of the ritual was growing. The belief in the real presence of Christ in the elements of the Eucharist was part of this growing spirituality. 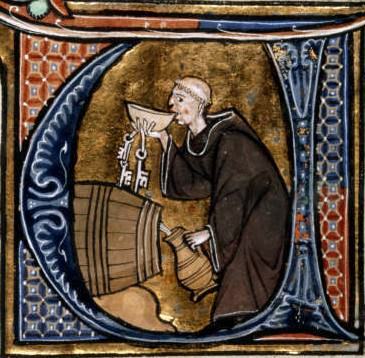 Wine was not only closely connected with impious lay practices, but its biblical symbolism was also ambivalent. These factors pushed the laity and the Church away from using wine in the Eucharist. At the same time, the principle of concomitance and the veneration of the host pulled people towards the use of bread in the ritual. By explaining more completely the absence of the chalice in the thirteenth century, this thesis aims to show the broader implications of this narrow doctrinal issue as well as to underscore the value of an approach that brings together separate historiographical traditions.